The SpaceX-3 Dragon cargo ship is seen attached to the International Space Station on April 20, 2014 for an Easter Sunday cargo delivery of 2.5 tons of food, supplies and gear for the orbiting lab's six-person Expedition 39 crew. This story was updated at 10:17 a.m. ET. It's not exactly the Easter bunny, but a commercial Dragon cargo ship built by SpaceX made an Easter delivery to the International Space Station Sunday (April 20) to deliver tons supplies, and possibly even some treats, for the astronauts on board. The robotic Dragon spacecraft arrived at space station Sunday morning, floating within reach of the orbiting laboratory's robotic arm. Station astronauts used the arm to capture the Dragon spacecraft as both spacecraft sailed 260 miles (418 kilometers) above Egypt and the Nile River. The Hawthorne, Calif.-based SpaceX launched the Dragon cargo ship toward the space station on Friday (April 18) using its own Falcon 9 rocket that lifted off from Cape Canaveral Air Force Station in Florida. The mission is SpaceX's fourth Dragon flight to the space station and third of 12 cargo delivery missions under a $1.6 billion deal with NASA. The Dragon spacecraft is carrying 5,000 lbs. (2,268 kilograms) of food, supplies and gear for 150 different experiments. A miniature lettuce farm, space robot legs and laser communications system are among the delivery's highlights. A SpaceX Dragon cargo ship is captured by astronauts using the robotic arm on the International Space Station in this close-up camera view from the outpost on April 20, 2014. The Dragon capsule delivered nearly 5,000 lbs. of supplies to the space station crew, the third such SpaceX flight for NASA. Bill Gerstenmaier, NASA associate administrator for human exploration and operations, said Friday that he wasn't sure if those supplies included any chocolate eggs, jelly beans or other Easter goodies for the station crew. "It'll be a surprise for all of us when they open the hatch," Gerstenmaier said. That hatch opening is slated to occur on Monday. 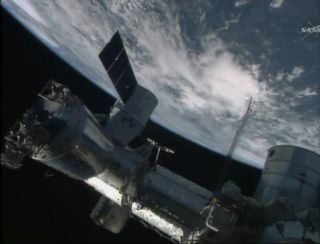 SpaceX's latest Dragon cargo ship was captured by space station commander Koichi Wakata, of Japan, and NASA astronaut Rick Mastracchio, who watched over the spacecraft's approach to the station from the orbiting lab's Cupola observation deck. The spacecraft will return to Earth in May to return science experiments and other gear to NASA scientists. "Congratulations to the entire team for the successful rendezvous and capture," Wakata said. "The vehicle and spacecraft was very solid and very stable." A SpaceX-built Dragon cargo ship floats near the end of the International Space Station's robotic arm, with the Earth as a backdrop, in this view from a station camera captured on April 20, 2014. The Dragon cargo ship delivered nearly 5,000 lbs. of supplies to the space station. The arrival of SpaceX's Dragon occurred nearly a month late. SpaceX initially aimed to launch the cargo ship in mid-March but delayed the flight first to allow final checks, then due to a damaged Air Force ground radar used to support Cape Canaveral rocket launches. SpaceX is one of two companies with NASA contracts for robotic cargo missions to the space station. The other firm is Orbital Sciences Corp. in Dulles, Va., which has a $1.9 billion deal for eight delivery flights using its own Cygnus spacecraft and Antares rockets. The first official Cygnus delivery to the station launched in January. Dragon's Easter Sunday arrival sets the stage for a spacewalk later this week on Wednesday (April 23) to replace a broken backup computer on the station's exterior. The computer, called a Multiplexer-Demultiplexer or MDM, serves as a backup for routing commands to several key systems on the station's exterior. The backup MDM device stopped responding to commands on April 11, although the system's primary computer is still working fine. But to preserve redundancy, NASA will send Mastracchio and fellow NASA astronaut Steve Swanson outside the station on Wednesday to replace the faulty backup computer with a spare. Editor's Note: This story was updated at 10:17 a.m. EDT to reflect the successful berthing of SpaceX's Dragon cargo ship to the International Space Station.